Stream music, watch videos, play games – whatever you like doing online, you can do more of it with one of our low-cost Data Bundles. Standard rates apply to any usage outside the internet allowance. Once your subscription is expired you can renew the subscription by dialing the bundle code. Data not valid for roaming use. Terms and conditions are applicable and may vary. 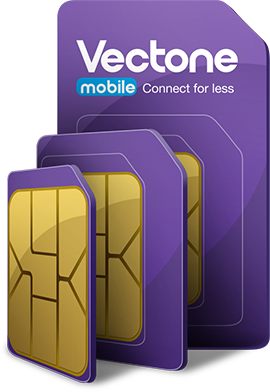 The offer is for non-commercial, private, personal use only - Vectone mobile reserves the right to withdraw or suspend the services or to disconnect you if we suspect that offer is being used for commercial purposes, for conferencing, or if it is not being used in a handset (in a SIM box for example), or if it is being used for tethering or any other reason Vectone reasonably suspects that you are not acting in accordance with this policy where we consider that the usage was illegitimate.